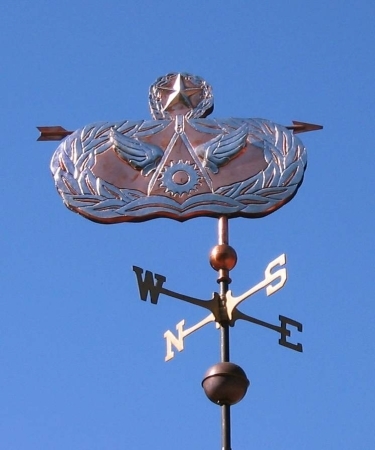 The Military Banner Weathervane featured here was commissioned by a frequent customer who often selects our weathervanes to give as gifts. She ordered this Air Force Banner Weathervane to acknowledge her brother’s long career of service and retirement from the military. As part of the ‘lucky penny‘ tradition we included a penny from the year he began his service and another from the year of his retirement. She also requested her brother’s name, including his military rank, be inscribed on the margin of the mirror image sculpture piece. 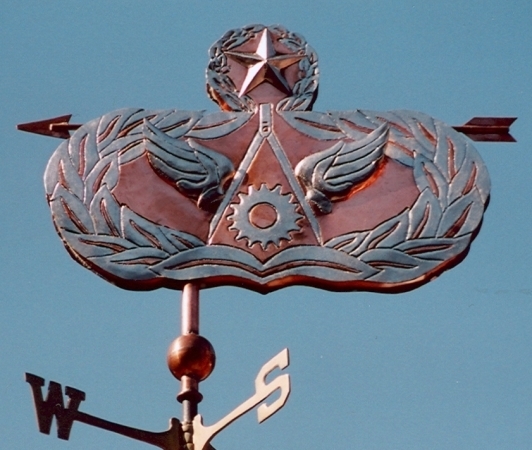 Executing this weathervane required detailed insignia. To accomplish this we heavily chased a thin line directly into the copper sheet with a precise hammering technique. By indenting the copper in the chasing process, the metal to either side raises up slightly creating a low relief. This chasing creates a modulated surface with light and shadow accenting the nuanced texture. We then applied optional palladium leaf to create the distinctive coloration of this classic design. As the copper darkens to a deep chocolate brown, the contrast with the silver coloration will become even more distinct. Our customer was so excited to see how her order turned out she had it shipped directly to her home and when her brother next flew in from overseas she surprised him with his gift. She reports it was a tender and gratifying moment. Because each of our weather vanes is made to order, we can customize any piece or design one for you. 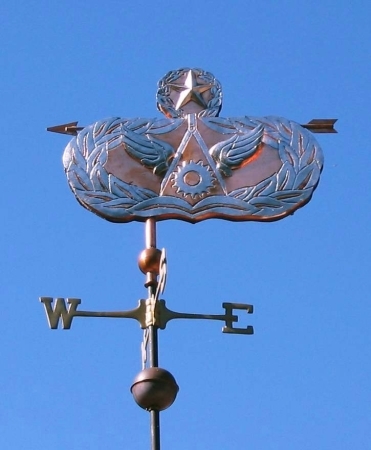 Please contact us if there is a banner or insignia that you would like us to make into a weather vane.